Dr. Shelley Anderson joined the team after completing her clinical residency at Tampa Bay Hearing and Balance Center in May 2015. She received her Bachelors of Arts degree in Special Education- Deaf Studies from the University of North Florida in 2009 and her Doctorate of Audiology (Au.D.) degree from the University of South Florida in May 2015. Dr. Anderson is trained in the areas of comprehensive audiological evaluations for patients of all ages, advanced hearing technology, osseointegrated (bone-anchored) hearing devices, electrophysiology (including electrocochleography, vestibular evoked myogenic potentials, and auditory brainstem response), videonystagmography, cochlear implant candidacy evaluations, and post-cochlear implant programming. She works with all three cochlear implant companies: Advanced Bionics, Med-El Corporation and Cochlear Americas. Dr. Anderson’s main areas of interest in audiology include: cochlear implants, bone-anchored hearing aids and electrophysiology. 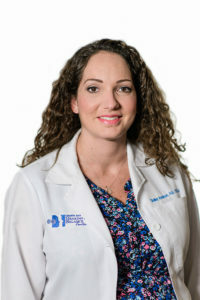 She is a licensed audiologist in the state of Florida and holds a Certificate of Clinical Competence in Audiology (CCC-A) from the American Speech-Language-Hearing Association. She is also a fellow of the American Academy of Audiology (F-AAA).